Immunogen: Synthetic peptide corresponding to the sequence near the N-terminus of rat vasopressin receptor V1b. Predicted MW of ~47kDa. Higher MW species (~50kDa) also observed by Western blot which reflects post-translational modification of the receptor. 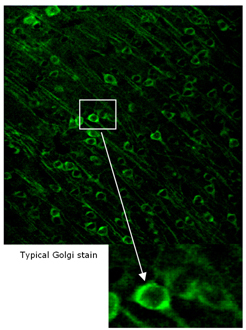 Scientific Background: Arginine vasopressin (AVP) is a nonapeptide hormone produced in magnocellular neurons of the hypothalamus, which functions as an antidiuretic in the kidney and systemically as a regulator of vasoconstriction, blood volume, and blood pressure. AVP acts by binding to a set of specific seven transmembrane domain-containing G-protein coupled receptors (GPCR) classified into three groups: V1a (V1), V1b (V3), and V2. V1b receptors stimulate adrenocorticotropic hormone (ACTH) release in the anterior pituitary, but may also participate in corticotropin-releasing hormone (CRH) release by the hypothalamus. The V1b receptor signals through coupling of Gq/11 alpha subunits, activating phospholipase C and release of intracellular Ca2+ via phosphoinositide second messengers. V1b receptor overexpression is a common marker for ACTH-secreting corticotropic adenomas. V2 receptors in the collecting ducts of the kidneys stimulate adenylyl cyclase activity, regulating the reabsorption of water via aquaporin channels. at 1:1000, and visualized at 40x. 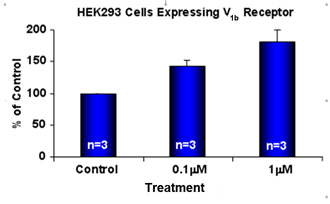 Cellular ELISA: HEK293 cells expressing V1b Receptor were treated with indicated concentrations of agonist (Vasopressin) and probed with Vasopressin Receptor (V1b) pAb (1:1000 of a stock solution of 1µg/μl) by ELISA. Data from vehicle treated cells were taken as 100%. Results are the mean ± SEM (n=3).